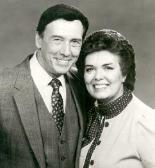 Shalom Productions was founded in 1977 by Henry and Hazel Slaughter in Nashville, Tennessee. Promotional materials from 1977 state that his studio could do 1,000 records with full color jackets for $3,680. The Slaughters traveled the US in a big silver bus during the 1970’s, performing and telling gospel groups how to enlarge their ministry through record albums.